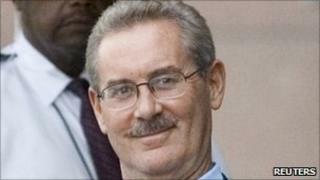 Texan billionaire Allen Stanford has filed a countersuit against US prosecutors, accusing them of depriving him of his constitutional rights. The lawsuit claims prosecutors "undertook illegal tactics" in their investigation of Mr Stanford's alleged pyramid scheme that they claim defrauded investors of $7bn (£4.3bn). Mr Stanford is seeking $7.2bn in damages from the SEC and FBI. He has pleaded not guilty to fraud, conspiracy and obstruction. Last month, a US federal judge ruled that Mr Stanford was unfit to stand trial. District Judge David Hittner ruled that he did not have the mental capacity to assist his lawyers. Mr Stanford, 60, is accused of running a scheme that persuaded investors to buy certificates of deposit from Stanford International Bank, located in Antigua. He has been in custody since June 2009. Mr Stanford rose to prominence in the UK and the Caribbean for his lavish sponsorship of cricket. In 2008, he bankrolled a high-profile $20m cricket match between England and a Stanford All-Stars team in Antigua.